Fiction is often most meaningful when it explores questions we find too disturbing to ask in the everyday world. Through one girl’s struggle to claim her own identity, The Lost Girl addresses some fascinating ethical questions, all the while presenting a measured, powerful essay on the value of human life. Fifteen-year-old Eva lives, sleeps, and breathes someone else’s existence. As an echo, a carbon copy of a girl halfway across the world, she learns everything that Amarra learns and is even nearly forced to suffer the same physical injuries as her other. There have been various books that explore cloning, but what’s so unusual about this one is the psychological element, since it’s not just Eva’s organs that are being harvested, it’s her entire entity and identity. One of the things I liked best about this book is the way the science fiction elements are handled. The creators of these echos are called Weavers, and they are presented in a somewhat mystical and mysterious manner. It has a similar tone and feeling to the film Children of Men, and the book is not unlike the way some of Bradbury’s futuristic tales are written; that is, these just happen to be human beings in extraordinary circumstances, rather than a fantastical, tech-heavy setting with some humans in it. The writing is also well-paced, thoughtful, and beautifully descriptive, deftly balancing gravity and humor, as well as joy and sadness. Eva recalls a man with “a voice like thunder and lions” and upon her relocation, marvels at how familiar her new home seems. I had been sent pictures all my life, of course, and Mina Ma had told me long stories about Bangalore. She had described streets, places, pieces of her life. As a child, I sat at her feet and drew picture, inspired by her voice and the flickers of memory passed on through Amarra’s and my consciousness. So many of those pictures had been true. There were ashoka trees down the middle of a long road, just the way I’d imagined…There were little stalls along the roads, open late, tea stalls with clinking steel cups and sweet shops with packets of crisps hanging from makeshift roofs. Or chips, as Mina Ma called them. Coke and Pepsi in glass bottles with steel caps. Men crouched on the edge of the road, smoking tiny not-quite cigarettes. Every character left an indelible mark, from Eva herself to her gruff caretaker Mina Ma to her brother Nikhil to her friends at school. I was enraged by the casual cruelty Eva endures, and the parents later made me so angry that I couldn’t see straight. I do wish that Sean and Ray had a chance to be a little more developed, though the love story–and the love interest–still squeezed my heart. When I initially finished the novel, I rated this a 4.5 because there are some elements that might have been explained a little more, and I thought the ending was a bit rushed and perhaps a bit like a more typical YA thriller. But who am I kidding? A book that treats human life with this kind of reverence deserves nothing less than 5 stars. This book explores loss and grief in a way you wouldn’t necessarily expect in speculative fiction and tears dripped down my face for nearly an hour as I was reading it. It is an stunning elegy for those who have been lost, a cry of sorrow for those who are left behind, and a profoundly sad lament for those whose very existence is denied. This elegant novel touched me deeply, and will leave readers with a lingering feeling of grief that is all the more devastating for its restraint and its dignity. Recommended for: those who appreciated the themes explored in Children of Men and Never Let Me Go, those who anguished over the emotion in If I Stay, those who were drawn in by the unconventional, philosophical story in A Certain Slant of Light, and adult readers who might like to try out more quality young adult fiction. Author Sangu Mandanna also joined us on the blog with a guest post about her inspiration for this novel! You may be surprised to hear what she has to say. This book Sounds awsome I have it set up for my next book haul from Amazon! This one sounds wonderful, love the world they are in and the books that you mentioned in comparison for the feel of this one are many I loved! Got to read it! Yay for supporting debut authors! I’m in the middle of NEVER LET ME GO, Elle, and both books are quite gorgeous. Thanks so much for your comment. Omg! I’m so glad you liked this! I actually got it last week, but haven’t got a chance to read it yet. I’m especially excited about it now since I’ve read Never Let Me Go and loved it so much! It’s one of my favorite books! You had me at ‘If you’re a fan of Children of Men’. I was just discussing that movie the other day. It’s absolutely genius. I’ve heard really great things about this novel. The premise really sounds like something I’d enjoy….a lot. I have high hopes! I loved reading your review on this. I’m not sure if it is still a book I’d love but I do want to read it. I added it to my to-read list when I first heard of it but I haven’t been able to check out any reviews of it yet. I’m so glad you enjoyed this! I’ve seen many mixed reviews, so I was initially worried about it, but you have me excited now! Not just enjoyed…loved! And yes, I have an idea of what the criticisms for this book will be, but I must say none of it really made that much of a difference. The emotional heart of this book is what mattered to me. Very interesting cover and story. I can’t wait to read it! Thank you for this amazing review! Love your review Wendy! I want sooo bad! Why can’t money just grow on trees? ._. …or at least books! ;) That’s the mark of a true book lover, though–no matter how many books we have, it’s never enough, hah. Such an eloquent review, Wendy! You know I am in TOTAL agreement with you, I loved this book SO. And I also waffled back and forth on whether to rate it 4 or 5 (I met in the middle with a 4.5) and I sincerely hope this book gets the attention that it deserves! I think this is a great example of the amazing books being written in the YA genre. I love that it makes you think and ask questions in addition to entertaining you. 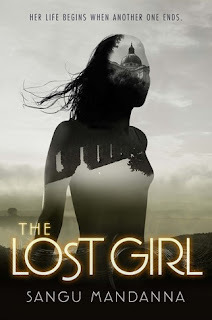 Yay for LOST GIRL love! I hope this one gets the attention it deserves, too. I hope everyone who reads it does his/her part to write a review and help support it however possible. CSOL is one of my absolute favorite books. I’m writing a guest post for another blog about hidden gems, and that one is definitely going on the list. ;) Thanks for stopping by, Heather! I hadn’t heard about this before now, so thanks for reviewing this one – it sounds like I’ve been missing out on a gem! This definitely sounds like something I would enjoy, so I’ll have to get my hands on it ASAP. Great review as always, Wendy! This sounds completely different from anything I’ve ever read! Beautiful and tragic, and tearjerkers definitely have a place in my heart. Emotional reads in general, really. I’m looking forward to reading this one! Wendy, this sounds magnificent, truly. I haven’t read Children of Men or Never Let Me Go, but both of the movies haunted me–and still do on occasion. I loved both those films, too. I’m in the middle of the book NEVER LET ME GO now and I am told I must read the other one–darn my friends and their relentless recommendations! This is only the fifth book I’ve rated 5 stars this year, I think. :) It’s been a good year for books overall, though, which certainly helps with writing enthusiastic reviews! Your review is so great!! I enjoyed this book a lot. I really felt for the characters. I understood both sides. Even with the slow pacing I was so invested in the story and had to know what would happen. Thanks Amy! The characters were all amazing, and I agree–the slow pace didn’t bother me, either. In fact, I quite liked it. Wendy, I loved the emotion in If I Stay so if you thought this one resembled it in terms of that, I know I’m going to love it just as much as you. The way you described how grief is treated as a theme in this one was beautiful. I was drawn in by IF I STAY and teared up at the end, but I didn’t cry for nearly as long a I did during this one! Not sobs, exactly, just slow, dripping, endless tears. So if that’s your sort of thing, you’ll love it, hah! I agree, though I wish there had been a bit more development with the two boys, I’m really fine with everything that happens. And I sincerely hope people find their way to this book, too. I haven’t read or seen Never Let Me Go (well I read like a third ages ago and DNFed, but I didn’t know it was going to be a dystopia at that point), but I did love the concept of Children of Men, which I own but haven’t read. If I Stay and A Certain Slant of Light were both books I completely adored. I need to read COM, too–I loved the film, but I hear the book is even more “raw,” according to my friend. And yay, I always love finding other people who love ACSOL. So many people get mad at that book, hah. I’ve seen you talking about this book on goodreads do I’m glad to see your review. The book sounds fantastic! The issue of cloning is definitely one that can bring up some great “human” themes, I think. Yeah, which is always why I’m surprised when some authors don’t tackle that more. I was incredibly disappointed in BETA, for example. This is like the anti-BETA. This sounds so interesting, I hadn’t heard of it before but now I really want to read it. Great review, Wendy. Hope you enjoy it, Belle. :) I think it’s a book that deserves to be read. Whoa, this book sounds fantastic! I love emotional reads and can’t wait to pick this one up. Will be back tomorrow to check out the author’s guest post. You are such a good book pusher, Wendy! I thought it was incredible, Lucy. I worry that some readers who expect a typical action thriller might find it too slow or introspective, but I think for the right reader, it’ll be an amazing reading experience. The premise is killer, Eunice…but the execution, sublime. :) Hope you get the book (and a box of tissues!) soon! Wendy, I agree this book is moving. It totally pissed me off in some parts but I loved how it raised my emotions! Nice review! Trying to get confirmation from the author one way or the other, Rachel. The way it’s written, it could be either! This is such a wonderful review, I absolutely love reading emotional books so I will definitely be picking up a copy of this! There are few books I’ve read this year that are more emotional, Mandee. Look forward to seeing what you think of it! Ooo, please do get ahold of this one soon, Keertana. I feel like if you aren’t scared off by my weepy review, you’ll probably enjoy this book very much, hah! And thank you, there were so many great quotes to choose from in this book. I’ve seen some awesome ones on other reviews, too. LOL no offense taken xD we’ll see how I fare, I’m a big softy lol. Wow, your review made me tear up! I have only heard fabulous things about this book and while I initially wouldn’t have picked this up I think I have been thoroughly convinced that this is a must read. Absolutely beautiful review! I kind of love it when one of my reviews makes someone cry, hah. I’m so glad you’ll consider giving this one a chance, Candace! Yay. It is coming out tomorrow – I might break my resolution to grab this book. Are you on a book-buying ban, Lyn? Aww. I am definitely hanging on to my ARC, but this is one of those books I fully intend to buy as gifts for my niece and other people. So important to help support debut authors whenever possible. I cant believe I dont have this book in my to-read pile. I mean, WoW! just wow! you lew me away with your beautiful review Wendy and I have no idea why I never paid any attention to this book before. I think this book will provide a lot of food for thought. Excited to see that it recieved the coveted five stars from you, Wendy. I love books that do a good job with the sci fi elements. I am excited to read this, If I ever clear out my TBR! Yeah, it was one of those things where as I went through the book again for my review, I thought, “What is WRONG with me? This deserves 5 stars!” The quibbles are minor, and they don’t detract from the emotional reading experience at all. Thank you, Miss Stardust! I hope you enjoy this one as much as I did. I’m still flabbergasted, hah. I LOVED this one! I was tearing up as well. Cloning is interesting but the whole idea that she had to study every inch of her life, copy her injuries, and how she wasn’t even allowed to finish a book if Amarra didn’t was so intriguing and sad. I felt bad for Amarra’s families loss along with Eva’s loss. YES, the part where she describes her frustration at not being able to finish BRIDGET JONES’ DIARY made me laugh, but it also made me sad for her as well. It’s one of those books that makes you feel bad for just about everyone in it, which is a rare thing. I was blown away by it, Sam. I thought it would be a typical dystopian-lite novel (how many of those have we seen over the last couple of years? ), but the themes it explored were heart-breaking. I hope you get your hands on this one soon, Roro. Totally worth getting for bookshelf. Amazing review Wendy! I love the sound of a story that leaves strong emotions and remarks on humanity. This does appear as a special book. Also, books that make you cry, are always amazing. Oh Eden, if the human element appeals to you, this is definitely the book for you! It was such a beautiful surprise to me. I hope we see more YA fiction that’s dares to be a little different, like this book did. I hope it makes you cry buckets and buckets, Jen! ;) And yeah, I really appreciated that the author focused on story and character rather than spending too much time convincing us this was The Future, if you know what I mean.